The River Ouse Corridor comprising over 140 miles of main river and tributaries is an important wildlife site of unique character. The tributaries of the upper catchment are mainly small forest streams cutting deep sided valleys through wooded countryside. 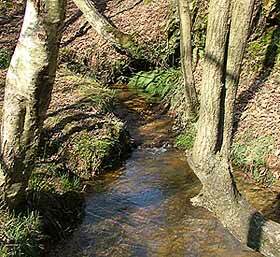 These drain High Weald areas of forest and heathland over a geology of soft sandstones and clays. Though often small and shallow, they are quick to respond to rainfall and in a few hours can be transformed to raging torrents. Some of the middle tributaries are similar, while others are characteristic of lowland streams flowing more slowly over clays and alluvium. 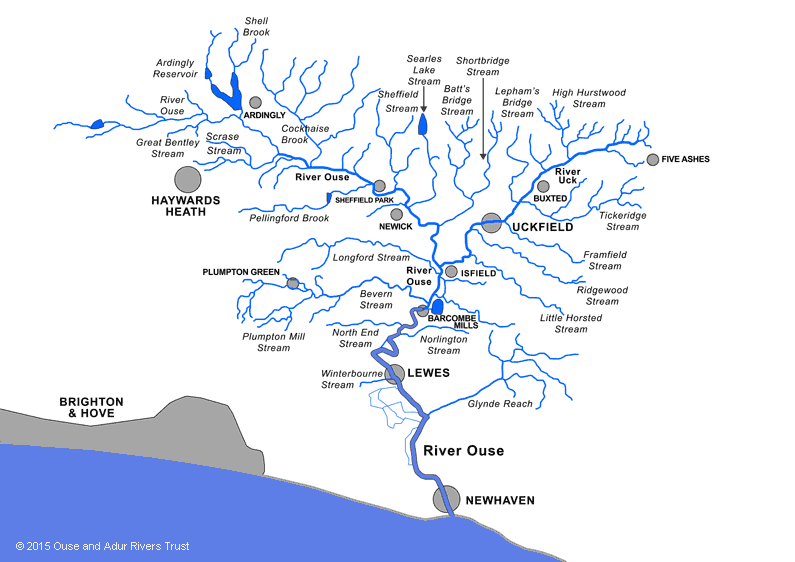 Two of the lower tributaries, the Bevern and Northend Streams are notable in that they are derived from springs rising in the chalk of the South Downs, continuing their journey over greensand and clay in their lower sections. The principal tributary of the Ouse is the River Uck, fed mainly by forest streams and similar in character to the middle reaches of the main river. The upper and middle reaches of the main river feature a varied riffle and pool system rich in wildlife, but stretches above some of the weirs retain the canal like features of relatively deep and slow flowing water; a legacy from the eighteenth century when the river was modified for navigation. The lower reaches downstream from Sutton Hall Weir are of more uniform depth (excluding the weir pools and races), typical of a lowland river traversing an alluvial plain. Below Barcombe Mills the river is tidal with the flow moderated by a half-weir at Hamsey. The waters support a diversity of plant life including water crowfoot and starwort, both listed in Annexe 1 of the EU Species and Habitats Directive as requiring the designation of a Special Area of Conservation. 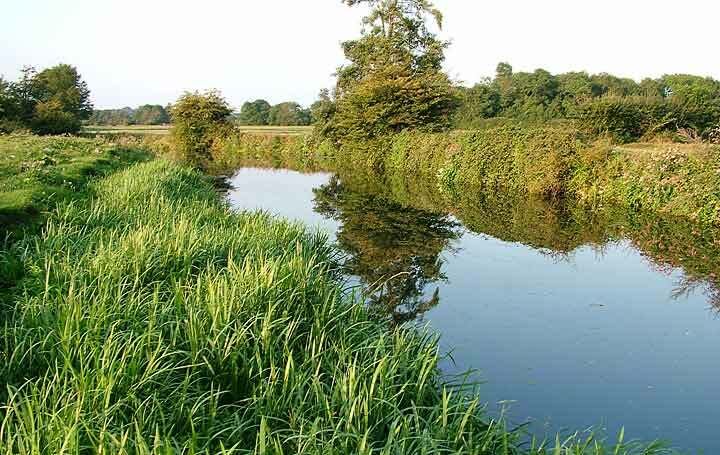 A vast number of invertebrates thrive in the river and its tributaries including mayflies, willow and alder flies, freshwater shrimps, swan and pea mussels, and some rare types of water beetle to name but a few. The river supports a thriving population of wild brown trout in its upper reaches and they are found in most tributaries. It is also notable for its migratory brown trout which ascend each year to their spawning grounds in the gravel beds of the tributaries. It contains most species of coarse fish indigenous to the British Isles, including rarer fish such as grayling, barbel, stone loach, river lampreys, and bullheads. 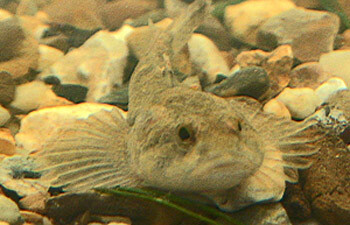 Bullheads are named in Annexe 2 of the Directive and describes as threatened on an international scale. The tidal stretches also contain sea fish that can tolerate the lower salt content here: flounder, grey mullet, bass, twaite shad, and sea lampreys. Some of these enter the river to spawn in the brackish water. The sea trout are especially notable, as they appear to gain the highest average weight of any population found in the British Isles. Adult fish vary in size from two or three pounds up to fifteen pounds or more. It is rare for an angler to catch a fish under two pounds and the average is over five pounds. 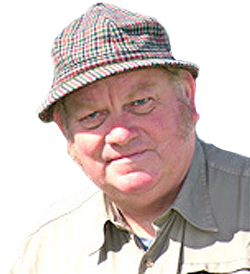 Local interest groups consider the sea trout to be the “jewel in the crown” of the river’s virtues. The habitat rich environment of the River Ouse supports a wide range of bird, mammal, and insect life, including some rare species of butterfly, the endangered water vole, and of course a considerable variety of birds including kingfishers, water rail, reed and sedge warblers, and grey wagtails. These species thrive in the undisturbed bankside vegetation which provides secluded nesting sites. However, the future of our river is constantly under threat from a variety of human activities, not least of which is a proposal to canalise it for the use of motorised pleasure craft. Inappropriate man made structures, intensive farming methods, weak legislation and lack of investment in conservation all take their toll. The rise in population density of the area leads to an increase in water abstraction and polluting effluents. Local people and others who value this ecological heritage have expressed concern at the perceived decline of its health. OART believes that this concern can be harnessed, and with appropriate expertise and effort the decline can be halted and reversed. THE NATURAL ENVIRONMENT IS OUR GREATEST ASSET. IT MUST BE PRESERVED.